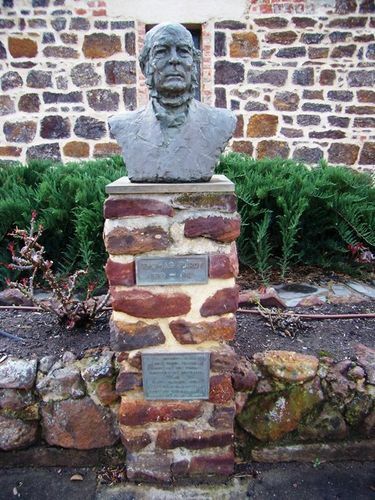 A bust of Thomas Hardy commemorates 125 years of winemaking by Thomas Hardy and Sons. Thomas Hardy who arrived in the colony in 1850 at the age of 21 and first obtained employment with John Reynella, prior to his departure for the Victorian goldfields. He later returned to South Australia to plant vines, orange and other fruit trees, however, his big break came when he purchased the Tintara Vineyard Co. in 1873 on a walk in walk out basis. He found enough wine in the cellar to pay for the purchase of the property and so began a life time of experimentation and research, which he willingly shared with others in the district. Unveiled by Mrs. Tamie Fraser wife of the Prime Minister of Australia on 23rd October 1978 to commemorate 125 years of winemaking by Thomas Hardy & Sons.